TCI electronically controlled automatic transmissions are engineered to deliver smooth, consistent and trouble-free performance. TCI offers a variety of electronic accessories, that are designed for use with electronically controlled automatic transmissions, that are sure to enhance the driving enjoyment and performance feel of your vehicle. 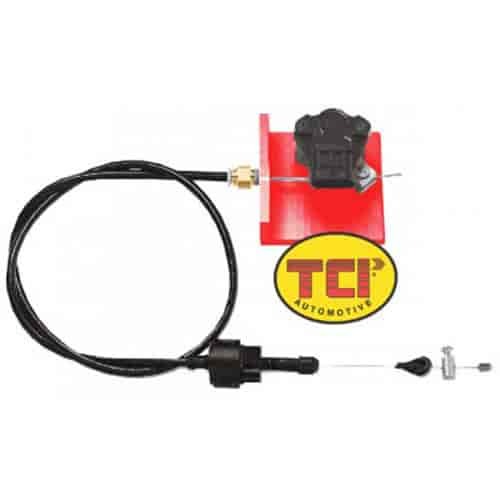 377400 - TCI Transmission Control Electronic Accessories is rated 4.0 out of 5 by 2. Rated 5 out of 5 by Scot Rods Garage from Great product This I Scot Rods Garage and this is a great way to keep some of the clutter off your engine. We mount these under the dash so they do not have to be seen. Rated 3 out of 5 by Scooters specialty automo from Tic remote tps I received it and it was broken as I opened it. I had to repair the mounting as the screws were to small anD flimsy for the job and cabling was way to long ? Quality control ?